A veteran courtroom lawyer and "well regarded litigator" (Chambers USA 2017), Tom Alleman is at home in trial and appellate courts throughout the United States. His practice focuses on litigation, commercial insurance coverage questions ranging from cyberliability and data breach questions to environmental and D&O issues, regulatory proceedings and advice involving complex environmental and toxic tort issues, and legal challenges facing financial institutions. His extensive experience enables him to step in on short notice when necessary to assist clients in resolving problems or trying cases. Mr. Alleman is the Co-Director of Dykema's Insurance Industry Group. Tom has been involved in hundreds of matters involving insurance and risk management questions in fields ranging from autonomous and connected vehicles and related technologies to environmental management, corporate management, catastrophe claims and oil and gas production. In addressing these questions, Tom has become intimately familiar with a wide range of insurance policies, including data and cyber policies, CGL, D&O, E&O, OCIPs, CCIPs, umbrella and excess policies, reinsurance treaties and slips, and commercial property policies. Tom’s extensive litigation experience enables him to assist clients in avoiding pitfalls that can lurk in transactional documents, risk management programs, insurance policies and indemnification agreements. He currently handles major matters throughout the United States, with extensive experience in coverage matters in Texas, Oklahoma, Kansas, Nebraska, Iowa, Missouri, Arkansas, Louisiana, Mississippi, Alabama, Florida, Georgia, South Carolina, North Carolina, Tennessee, Kentucky, Utah, New Mexico, Virginia, West Virginia, New Jersey and Minnesota. Leader of Dykema team providing research and support on risk management and insurance issues to University of Michigan MCity autonomous and connected vehicle program. Negotiated successful resolution of insurance coverage issues and payment of policy limits for costs resulting from cyberattack on lender’s systems. Analysis and negotiation of cyberinsurance programs for health care organizations and banks. Represented insurer of lithium battery manufacturer in resolving coverage issues associated with alleged defects in and damage allegedly caused by defective batteries. Coordinating insurer response to three major natural gas explosions each resulting in multiple claims for injury and property damage and significant additional insured and contractual liability issues. Representing banks, financial institutions and directors and officers in multiple ongoing claims under D&O and Bank Professional Liability policies. Counsel in multiple claims involving construction of CGL policy endorsements for oilfield and upstream oil and gas operations. Obtained summary judgment for policyholder in case of first impression concerning control of defense and settlement under policy with self-insured retention (Powell Elec. Syst. Inc. v. National Union Fire Ins. Co., 2011 WL 3813278 (S.D. Tex. 2011)), resulting in reimbursement of $1.7 million to policyholder. Counsel to policyholder in Don’s Building Supply Inc. v. OneBeacon Ins. Co., 267 S.W.3d 20 (Tex. 2008), in which the Texas Supreme Court adopted an “actual injury” trigger for claims of latent and ongoing property damage. Counsel to capital markets lender group in issues relating to certificates of insurance and other documents used as proof of insurance. Counsel to lenders, servicers and property owners in resolution of multiple insurance claims arising out of hurricanes and other natural disasters. Tom has been involved in environmental litigation since the first wave of Superfund litigation in the 1980s. He has had active hands-on experience with environmental and toxic tort matters including coal combustion products and fly ash, upstream and midstream oil and gas products and waste including saline substances, underground resources and pollution buyback endorsements, pipeline releases, NORM, chemicals, asbestos, MTBE, chlorinated solvents, D-NAPLs, and insecticides. In addition to litigation, Tom advises clients with environmental regulatory issues relating to air, water and solid waste permitting and enforcement and environmental audits under Texas and federal law. Represented PRPs in more than 30 clean-up actions arising out of CERCLA, RCRA and analogous state statutes, including actions under CERCLA §§ 107 and 113, at sites in twelve states. Represented defendants in more than 40 toxic tort lawsuits in federal and state courts in eight states involving coal combustion products, FGD sludge, insecticides, herbicides, lead, arsenic, hexavalent chromium, cadmium and other metals, chlorinated solvents, crude oil, natural gas, gasoline and other petroleum products, spray paint propellants, paint thinner, vinyl chloride, acrylonitrile and residues, asbestos and other substances. Managed mass tort and catastrophe litigation including three lawsuits involving natural gas releases from horizontal directional drilling, five suits involving alleged mass toxic tort exposure, and the Hyatt Skywalks litigation involving 114 deaths and over 3,000 significant injuries. Represented defendants in at least twenty administrative or judicial actions seeking imposition of penalties for alleged environmental violations, including responses to whistleblower actions and a suit under Section 7.351 of the Texas Water Code. Represented both insurers and policyholders in over 100 disputes involving environmental insurance coverage questions. Currently is engaged in three mass tort actions in Missouri, Florida and Nebraska involving releases of natural gas with resulting explosions. Tom successfully resolved claims in the Missouri action and, as lead negotiator for the defense and insurer group has crafted a global settlement in the Florida action. Represents the largest manager of coal combustion products in the United States in managing insurance issues related to a 78-plaintiff mass toxic tort action in West Virginia and a 500-plaintiff action in Virginia. Obtained a “win-win” settlement for regional real estate developer in suit by state and municipality under section 7.351, Texas Water Code, alleging violations of multiple environmental statutes – the city agreed to donate property for development project as part of settlement while accepting settlement that was two per cent of original demand. Represents defendants in CERCLA litigation involving the Chemetco and U.S. Oil Recovery sites. Tom has also been involved in CERCLA litigation involving Conservation Chemical (three sites), Brio Refinery/JOC Oil, Motco, Martha Rose, Hardage-Criner, Diaz, Bayou Sorrel, Rose Metals, and other sites. Provided advice to businesses affected by 2015 Gold King Mine disaster and closure of Animas River in Colorado. Advised lenders in over 30 engagements on proper management of environmental risks in loan transactions. Counseled clients on ten environmental self-audits and permit issues. Advised over 50 clients on issues relating to environmental risk programs and proper use of environmental insurance. Represented over 50 clients, including borrowers, lenders and trade associations on issues relating to NFIP and flood insurance. Lead author, Mortgage Bankers Association white papers on environmental insurance and issues relating to mold in commercial real estate transactions. Advised an owner of biomass boilers in responding to enforcement actions for alleged violations of NSR and Title V permits, including management of the process by which the client obtained a revised air permit that allowed operation of the facility at full capacity. Represented a publicly traded corporation on environmental issues associated with the possible purchase of a cryogenic natural gas processing plant. Tom advises financial institutions regarding insurance coverage for cyberliability and data breach issues, flood insurance compliance, director and officer liability, including liability for participation on non-board committees, and bond claims. Tom has represented community and regional banks in many class actions based on alleged ATM non-compliance checking account overdraft claims. In addition, Tom is a long time adviser to the Mortgage Bankers Association of America, in which he has been actively involved in issues relating to lender liability after foreclosure, mold, insurance, certificates of insurance and other matters vital to real estate owners, lenders and servicers. Representing directors and officers of three banks placed in receivership during “Great Recession” in defense of claims by FDIC of negligence, gross negligence and breach of fiduciary duty. Representing regional bank in defense of and insurance issues arising out of dispute over reloadable prepaid cards. Obtained multiple de minimus settlements of class claims against community banks alleging that ATMs and websites do not comply with Americans with Disability Act. Representing bank in indemnification claim by former CEO. Advising and training bank employees on flood insurance compliance issues. 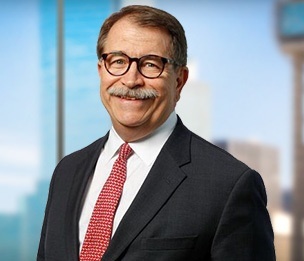 Tom also plays a role in improving the justice system, having served as chairman of the Court Advisory Committee and Merit Selection Panel for the United States District Court for the Northern District of Texas, and the Dallas Bar Association Task Force on Racial and Ethnic Bias in the Courts. Tom has lectured at the Washington University Schools of Law and Engineering, is the author of publications on insurance issues for lenders and servicers, a textbook on tort law and numerous other articles and publications. He is a frequent speaker for industry and professional groups. Additional Insured and Contractual Indemnity Provisions in Liability Insurance Policies – What’s Covered? "Coming to Terms With Contractual Liability Coverage"
"The Sound of Shoes Dropping: CFPB Moves to Bar Class Action Waivers"
Is your ATM A Lawsuit Risk?